Check-In: Friday, October 26, 6:00 p.m. Seminar: 6:30-9:15 p.m., continuing Saturday, 9:00 a.m. – 12:30 p.m. Continental Breakfast: Saturday, 8:30 a.m. Hosted by Riverside Church. Bob Allums has been with seeJesus since the very beginning. 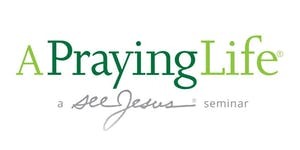 Though he was in pastoral ministry for 14 years in times past and has served Christian publishing companies such as InterVarsity Press and Crossway Books & Bibles, his great love is teaching the seeJesus seminars, especially A Praying Life. He has been regularly teaching the seminar both in the US and internationally for over twelve years. In fact, he enjoys it so much he is now the Director of A Praying Life Ministries for seeJesus. Bob and his wife, Helen, have three grown children, two grandsons, and live in Florida. "